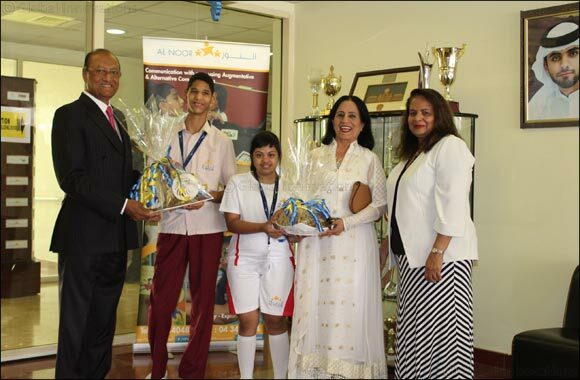 Dubai, June 14, 2018: Mr Paras Shahdadpuri, Chairman of Nikai Group of Companies has donated assistive technology equipment to the students of Al Noor Training Centre for Children with Special Needs. In line with the Year of Giving and the Year of Zayed initiative by treading on the path of the giving spirit, Nikai has donated equipment that were long required by the students to fulfill the needs of their therapy and overall improvement. Mr Shahdadpuri has been a patron of Al Noor and has been committed to aiding the Centre over the years. Six equipment of various categories were donated including - Variable Height Electric Tilt table, Range of Swtiches, Prox Talker, Tilting Therapy Bench, Light Aide and Boardmaker. Every equipment is used for specific purpose and benefits various levels of students at Al Noor. The devices will provide a holistic approach to learning and growth and to benefit all of the 220 students at Al Noor. Some of them will benefit different students in varied stages of growth. Commenting on the contribution, Mr. Paras Shahdadpuri said, “We are thankful to Al Noor Training Centre for giving us the opportunity to support their needs. The Nikai Group is a global conglomerate with business interests in Electronics & Appliances; Information Technology; General Trading; and food stuff.